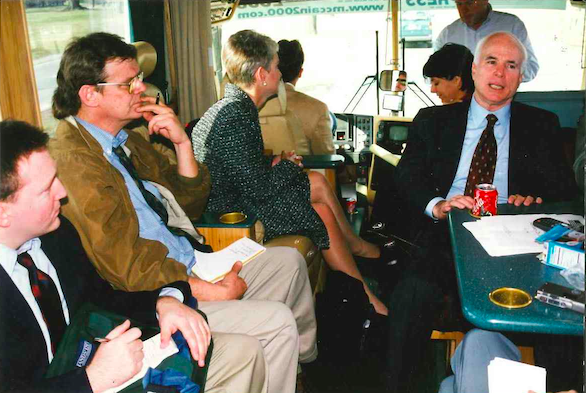 Howard Wilkinson (second from left) on the Straight Talk Express with then-presidential hopeful John McCain, circa 2000. There is probably no national political figure I have spent more "face time" with over the years than Sen. John McCain. And I am not complaining. In fact, I am grateful. Many times during his 2000 and 2008 presidential campaigns, I was summoned at the last minute to come to his campaign bus, The Straight Talk Express, and spend time interviewing the man who came close but could never achieve his goal of becoming president. I was with him so much, he even had a nickname for me – Old Timer. Well, Old Timer, time for you to get back to the Old Soldiers' and Sailors' Home. They'll be having bed check pretty soon. Once, in late February 2000, ten days before the March primary, I rode the campaign bus with him from Cleveland to Columbus to Cincinnati, in a marathon day of campaigning. It would be hard to meet a more principled, more experienced, more fascinating political figure than McCain, a pilot in Vietnam who was tortured within a shade of death and survived through sheer will to become one of the giants in the history of the U.S. Senate. McCain at a 2016 campaign rally. President Trump, referring to McCain, has said he liked "people who weren't captured." I beg to differ. I have known many former POWs of World War II, Korea, Vietnam and every one of them has been a man of extraordinary courage and perseverance. And, now, we see it again as McCain battles for his life against brain cancer. Even that hasn't stopped him from being a voice on the national stage. I'll treasure the time I spent with the man, even the times when he was telling me, Well, that's a stupid question! I first met him in early 1999, when he was considering a run for the 2000 Republican presidential nomination and was out and about the country, sounding out political journalists and big campaign donors. I was at my desk at the Cincinnati Enquirer one morning, minding my own business. The 2000 presidential campaign was the furthest thing from my mind that day. The phone rang; I answered; and, at first, I thought I was being pranked. This is Sen. John McCain. I'm over here in a room at the Queen City Club for a couple of days. 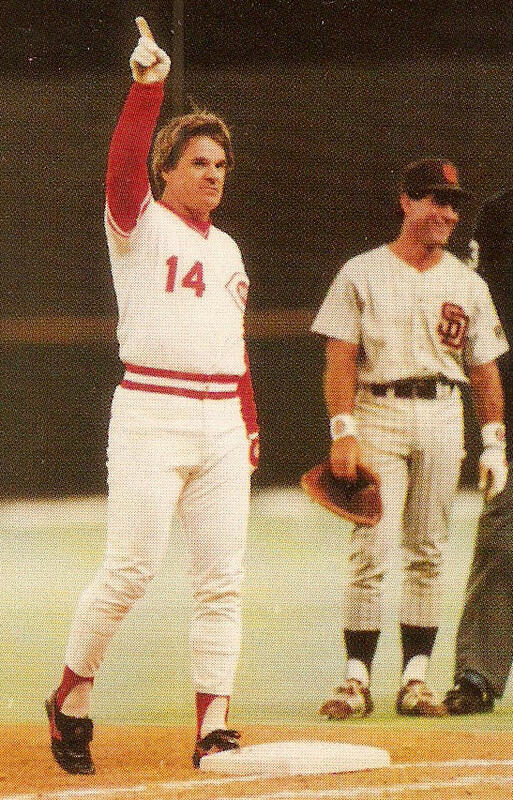 People tell me you are the guy in Cincinnati every politician needs to talk to. So, would you like to come over this afternoon for an interview? I figured out that it was, indeed, John McCain and, of course, I accepted the invitation and asked if I could bring along a photographer. McCain had no objection. The Queen City Club on E. 4th Street is the city's oldest and, arguably, the most prestigious private club in the city. Nearly every big muckety-muck in Cincinnati is a member. If you were a male coming in to visit, you wore a jacket and tie. Which I did. I had a photographer with me and we walked over from the Enquirer at 312 Elm Street at the appointed hour. I told the woman at the desk who we were and what we were doing. There is no media allowed in the club. I tried to explain that we had been invited by one of their guests – a rather important guest named McCain. She still wouldn’t budge. We were not to be allowed upstairs to the guest rooms. She wouldn't even call his room for me. I excused myself for a moment and went across the room where I called the office and asked someone to look in my Rolodex for the phone number of a friend – one of the most powerful lawyers in town and a pillar of the Queen City Club. I got him on the phone immediately and explained the problem. Let me talk to her, he said. I could hear part of his end of the conversation. He was telling her in no uncertain terms that if Sen. McCain wanted to see us, we should be allowed upstairs immediately. There was a lot of, Yes sir, yes sir. No sir. Yes, sir. The next thing we knew, we were in McCain's suite, relaxing with a cup of coffee and talking politics. It was clear that he was as interested in learning the lay of the land in Ohio as I was in learning about why he was considering a run for the presidency. All in all, it was a good chat. And, of course, he did end up running for the GOP nomination in 2000. His principal opponent was George W. Bush, the son of the former president. 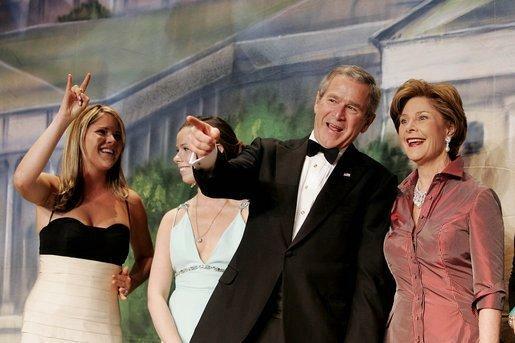 Bush had all the money – particularly in southwest Ohio, one of the prime areas for GOP presidential candidates to raise money. 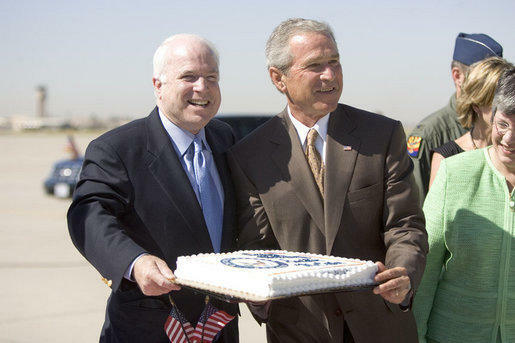 President George W. Bush joins Arizona Senator John McCain in a celebration of McCain's 69th birthday Monday, Aug. 29, 2005. But my most memorable day with McCain came in late February of 2000, 10 days before the March 7 Ohio primary. Bush was leading the pack, but McCain still had a shot. His campaign decided on a day-long trip on the Straight Talk Express that started in the morning in Cleveland, went on to Columbus, and ended with a huge crowd at a book-signing at Joseph-Beth Booksellers in Norwood. I took a one-way flight to Cleveland the night before, got a cheap motel room near the airport and was ready to roll in the morning. I took a cab over to the West Side Market, a Cleveland landmark known for its ethnic foods, fresh meats and produce and, for generations, a magnet for politicians looking for a friendly crowd and great visuals. I caught up with the McCain crowd at the Straight Talk Express, which was parked outside the West Side Market. McCain's wife, Cindy, was along, as were then-U.S. Sen. Mike DeWine and his wife Fran. DeWine had gone out on a limb supporting his Senate colleague for president while most of the rest of the Ohio GOP establishment were lock-step behind Bush. But DeWine stuck with his candidate; and on that day, he and Fran were going to ride the bus all the way to Cincinnati, along with about half-a-dozen politics reporters, some TV videographers and campaign staff. Inside the market McCain stopped at baked goods stands, an Asian spice shop and Czuchraj Meats, where he whipped out his wallet. "Sorry to mess with your Saturday morning business," McCain told owner Jerry and Jill Chuchray, as a crush of media and McCain fans pressed against the glass cases of kielbasa, pork chops and corned beef. The candidate bought $20 worth of kielbasa, some long sticks of pepperoni and beef jerky, which he said he would "take home to my kids. They love it." DeWine shelled out for two pounds of Czuchraj bacon, prompting McCain to tell the media mob that "Mike DeWine always brings home the bacon." Outside the market, on W. 25th Street, a crowd of about 500 supporters had gathered by the Straight Talk Express. McCain gave them an impromptu pep talk, saying that, as president, he would "take the government out of the hands of the special interests and give it back to you." 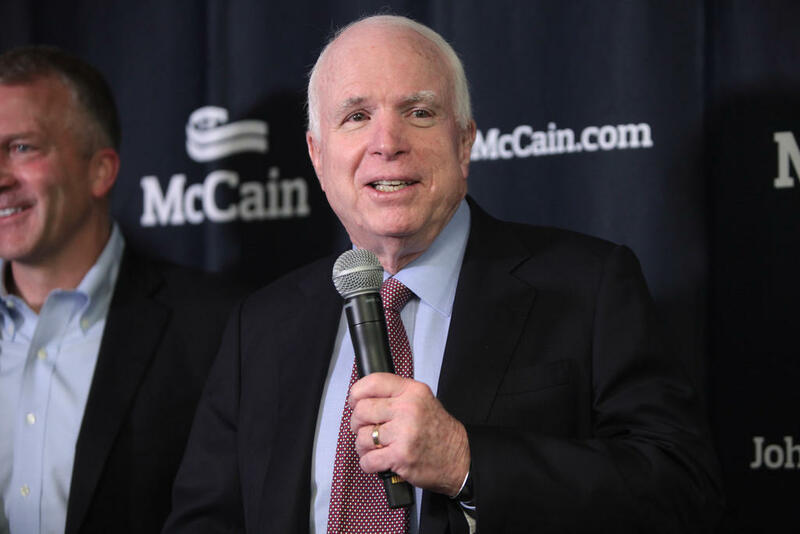 "We are going to break the iron triangle of money, lobbyists and legislation,'' McCain said. The crowd cheered. McCain and his entourage climbed back on the bus and we were soon on southbound I-71, bound for Columbus. The candidate took a pocket knife and began slicing off hunks of Czuchraj pepperoni, passing them out to whoever wanted some. I took my hunk and gobbled it down, chased with a cup of black coffee. "The breakfast of champions,'' McCain said, getting a laugh from the reporters and staffers gathered around him. Mrs. McCain just rolled her eyes. On the bus ride, he dismissed the Bush campaign's assertion that all of McCain's primary victories were due to Democrats and independents voting for him in GOP primaries. "I want anybody – Republicans, Democrats, Libertarians, vegetarians,'' McCain said. "Everybody is welcome in this crusade." "I'm like Luke Skywalker,'' he said. "We're still trying to get out of the Death Star. They're still shooting at us. But we're still battling the forces of evil." There was a stop in Columbus, for a question-and-answer session with students at St. John Arena on the Ohio State University campus, and then it was back on I-71 for the trip to Cincinnati – specifically, to the Joseph-Beth Booksellers parking lot at Rookwood Commons in Norwood, where McCain was to sign copies of his new book, Faith of My Fathers. I'll never forget seeing McCain staring out the window of the bus as it pulled into Rookwood Commons, where there were about 2,000 gathered. About half were there to go in the store and buy the book, the rest were there to show support for McCain. "Wow,'' McCain said, looking at the mob scene outside. "You know something? I think we can really pull this off." He arrived at 5:40 p.m. By 8 p.m., he was still in the store, signing books. "I assure you,'' he hollered to the crowd, "I'm going to stay here until every book is signed." It was the end of a really good campaign day for the senator from Arizona. In the end, it didn't matter – he lost the Ohio GOP primary to Bush, who had 58 percent to McCain's 37 percent. 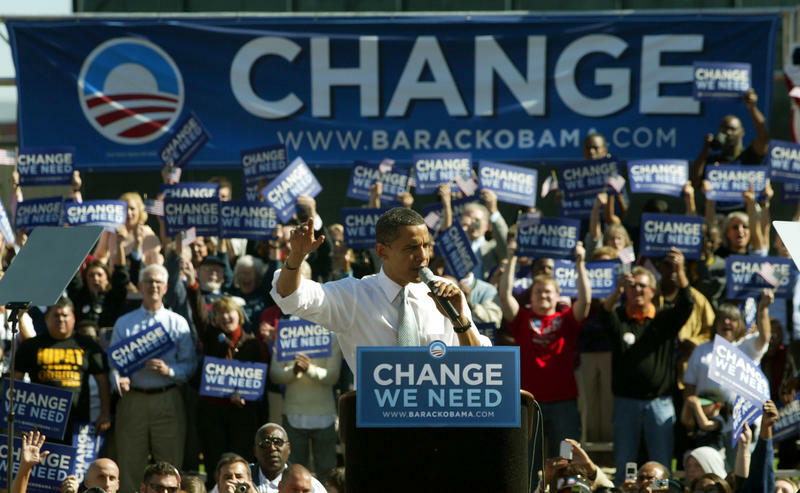 And when he finally won the GOP presidential nomination in 2008, he lost Ohio to Barack Obama by about four percentage points. But, on that day in February 2000, he was golden. He was riding high. I parted ways with him for the day at Joseph-Beth. He gave me a handshake and a wink. This Old Timer had to get back to the Old Sailors' and Soldiers' Home. Bed check soon. But I didn't want to go. I could have traveled with John McCain forever. Read more "Tales from the Trail here. Ed. 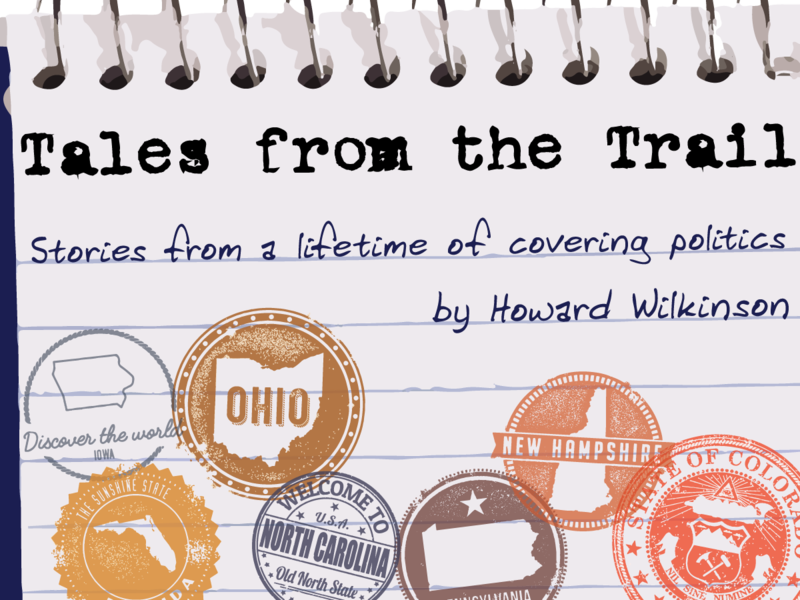 note: Howard Wilkinson launched his "Tales from the Trail" column on July 15, 2017, in an effort to take you behind the scenes of politics and hear some of the funny—and occasionally outright bizarre—situations that happen on the campaign trail. Since Wilkinson has been covering politics for more than 40 years, he has plenty of stories to tell. To mark the one-year anniversary of his column, we are republishing Wilkinson's first-ever "Tales from the Trail" here today.